The Archdiocese of Philadelphia is one step closer to sealing the deal to lease its archdiocesan cemeteries. Judge John W. Herron of Philadelphia Orphans Court permitted the management and lease relationship between the archdiocese and Levittown-based StoneMor Partners to go forward. Last December the judge had sought more time for community input on the proposed arrangement. Now satisfied that no major objections exist, he issued a decree Feb. 4 approving the deal. Key to the approval was the archdiocese’s intention to retain ownership of the 13 archdiocesan cemeteries, to direct StoneMor to continue operating them as Catholic cemeteries, and that the rights of all existing lot-holders will not be affected. In his written opinion Judge Herron said, “After careful consideration of the petition, the addendum, the certification of service, and the hearings, this court concludes that the archdiocese’s proposed lease and management agreements with StoneMor do not constitute a diversion of property from the purposes, uses and trusts to which they have been lawfully dedicated. “Whether these agreements are financially prudent is beyond the scope of this court’s review,” he wrote. That sentence points to the reason for the lease agreement: the heavy load of long-term debt totaling $350 million in 2012 held by the archdiocese which the agreement would help address. As announced Sept. 26, 2013, it calls for an initial payment from StoneMor to the archdiocese of $53 million with an additional $36 million spread out over future years of the 60-year lease. – no payments for years 1-5 and years 36-60. The current perpetual care fund of approximately $30 million, used to maintain the cemetery properties, will be retained in a special account by the archdiocese for use after the expiration of the lease. StoneMor will provide perpetual care during the lease and set aside funds to cover perpetual care of any lots sold during the lease. The archdiocese remains liable for accrued pension benefits for cemetery employees; StoneMor will be responsible for future earned benefits. The approximately 160 full-time employees of the cemeteries will receive two years’ job protection, or payment for any remainder of the two years if they are terminated for reason other than cause. 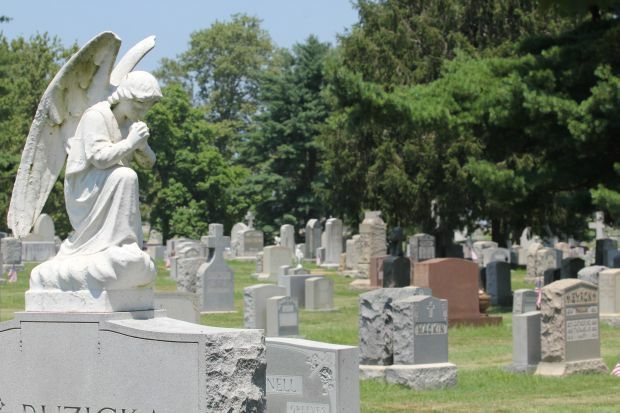 The affected archdiocesan cemeteries to be leased are All Souls Cemetery, Coatesville; Calvary Cemetery, West Conshohocken; Cathedral Cemetery, Philadelphia; New Cathedral Cemetery, Philadelphia; Holy Cross Cemetery, Yeadon; Holy Sepulchre Cemetery, Cheltenham; Immaculate Heart of Mary Cemetery, Linwood; Resurrection Cemetery, Bensalem; St. John Neumann Cemetery, Chalfont; St. Michael Cemetery, Chester; SS. Peter and Paul Cemetery, Springfield; All Saints Cemetery, Newtown; and Holy Savior Cemetery, Penn Township. The 50 parish cemeteries in the archdiocese are not affected by the agreement. At the time of last September’s announcement of the lease agreement, StoneMor chief executive Lawrence Miler said his company focuses on pre-need cemetery plot sales, and they hope to bring this expertise to the archdiocesan cemeteries. Because of the company’s size — it handles up to50,000 burials nationwide each year and expects to add another 7,000 locally from the leased archdiocesan cemeteries — it can purchase equipment and goods in bulk and operate the cemeteries more efficiently, Miller believes.